Chris did the best job watching my dog, Cricket. I have a very hyper Brittany Spaniel, who also is known to be a bit of an escape artist, and I don’t trust her to everyone. I do with Chris though and that’s saying a lot! He takes great care of her, takes her on long walks and Cricket absolutely looooves him…she gets so excited everytime she sees him. Highly recommend! Thank you Liberty. Such kind words. Give Crickey my highest regards. It is great you are doing pet care Chris. There is a huge need for your services no matter where you are and itseems to be an avenue that suits your personality. I have always appreciated how you and Erica would tend my herd in my absence. You have always done a stellar job with my pets that they did not seem to notice my absence. Harumph! I wish you were doing this pet sitting in Athens. I would certainly hire you immediately!!! Thanks Meg. I wish I could get DOGMAN back to Athens, GA, along with CATWOMAN (erica)! One day soon though, thanks for such high remarks. It was fun driving out there and finding all your cats hiding spots. i am eternally greatful when i find good pet tenders like you and will gladly be a personal reference for you. i would entrust you with my babies any day. Thanks Adrienne. I hope Magda is showing you all the hot spots around brooklyn. Give kevin, you, and Magda a big beardy hug for me. When I needed someone to watch my kit-cat while I was away, I knew Chris was my guy. I only needed someone for the basics (fresh food and water, litter box, etc. ), but with Chris, I got much more! He took the time to give her love and attention too. I think they fell in love. I even think Mushy was a bit disappointed when I returned home. It’s wonderful to know that you can leave home and your lovebugs will be taken care of physically and emotionally. Thanks, DOG-MAN! Hey Toni! Mush-Mush is a very special cat, most chilled out cat ever, competing with the infamous garfield. I loved giving her food and water and petting her soft little head. Ruby was very special too. Glad there’s people out there like you who will take great care of rescue pets. Inspiring. Chris and I had the opportunity to help out a family with their pet dog last summer in Atlanta. Chris was very conscientious, kind and caring with the family pet.. He took Coco for numerous walks during the day and made sure she was fed and entertained. Chris is a patient and caring person who would be a great choice for a pet sitter. Thanks Wayne, You and Marcia were both integral in sharing the Coco responsibilities. Thanks for such kind words. Chris was awesome! Was able to help me out last minute. Reliable and a great communicator; Chris kept me updated and responded with efficiency and thoroughness. My dogs were psyched, and I’m psyched to have someone in town I can totally depend on the next time I need someone to care for my girls. Thanks so much Chris, you rule! Thanks Caroline- Kona and Penny were both a joy to walk and throw sticks with at the park, they are truly good pals. I love chewing on some toothpicks, likewise Penny loves chewing on sticks. This became a profound realization for me while I was walking her that I was actually part dog. Chris is great! He went above and beyond to make sure my dog was well taken care of, often taking her on walks longer than scheduled. 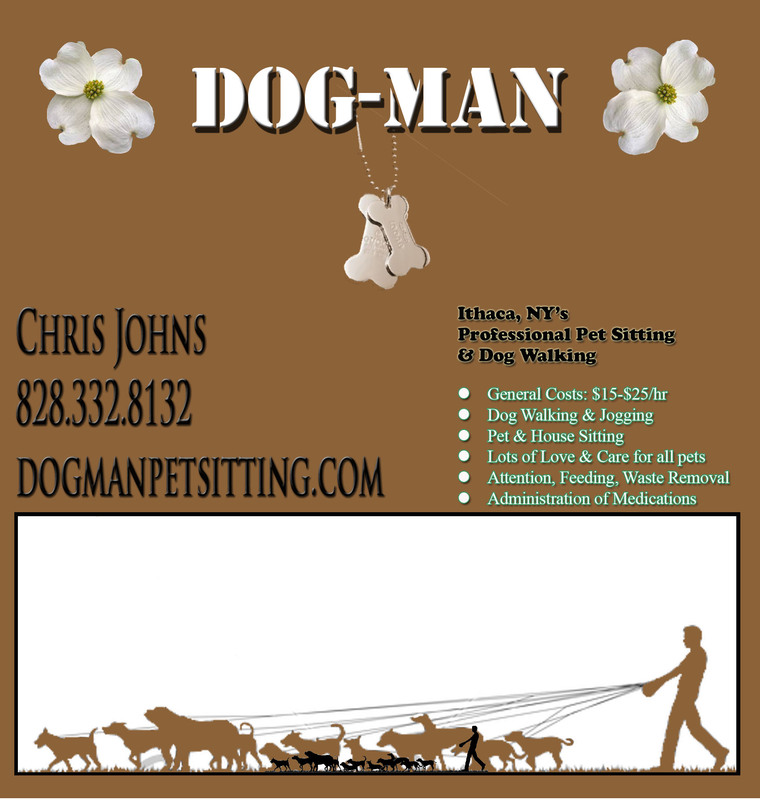 I always trusted that my dog was safe, and I would highly recommend Chris if you’re looking for a reliable and professional dog walker! Thanks Sean! Cherie was such a good girl to walk, very well behaved. We wish the both of you the best of luck in the big apple. Dog-Man isn’t just good with dogs. My cat, Teddy Bear, needs medicine every day, so it’s not a simple thing to ask someone to take care of him. Chris took such loving care of Teddy that I don’t think Teddy missed us at all. It’s wonderful to be able to travel without worrying about your pet. Thanks Betsy. It’s true, DOG-MAN’s alter ego CAT-MAN, is always more than happy to take care of four-legged creatures of all kinds! He has watched them all multiple times while we have been away for a week to 10 days. Our crew can be high maintenance, but Chris takes care of them no problem. I am all business when it comes to my furry lives so I won’t entrust them to just anyone. Last August, we were away for 10 days in Washington state visiting family, and 3am the night before we left our cat was clipped by a car. She was ok, but her hind quarters were In need of care. After talking with the vet and Chris we decided to leave and he would take her in for her check up. He took amazing care of her. I never worried. The vets office was impressed, etc. All around happy to have found him! Thanks Shannon- love your place, your pets, your pugs. Much pug-love. Let me know if you need anything, walks etc., for your newest addition Rico! Chris has taken great care of my basset hound, Heidi. I’ve appreciated his quick response to emails, attention to detail, his careful documentation of his services and Heidi’s particular needs, and the fact that he’s let me know that everything’s going ok with texts and photos while I’m traveling. With an older dog, I’m always a little nervous about leaving Heidi behind on her own, but I’ve been able to relax as Chris provides her with the attention and care she needs in the comfort of her own home. Chris is the best! Thanks so much Meghan, pleasure working with both you and Heidi. Congratulations with your move!